Jupiter Ascending was originally billed to be one of the biggest films of Summer 2014, however, we’ve since received the disappointing news that instead of being released on 18 July this year as planned, it has been postponed until 6 February 2015! Set in the future, Jupiter Ascending stars Mila Kunis as Jupiter Jones, a young woman who is targeted for assassination by the Queen of the Universe and consequently realises her destiny to end the Queen’s reign. Mila Kunis may be the leading lady but she is by no means the only star of the show; Channing Tatum, Douglas Booth, Eddie Redmayne and Game of Thrones star Sean Bean are all part of the incredibly strong cast, which guarantees impeccable performances throughout. Perhaps the most exciting aspect of the cast is the fact that Eddie Redmayne plays the villain. Most famous for his role as Marius in the big-screen adaptation of Les Miserables and Colin Clark in My Week With Marilyn, Redmayne has a bit of a reputation for playing the lovestruck hero who immediately captures the sympathy of the audience. This is why seeing him as Balem, the evil ruler of the Universe who wants the film’s hero Jupiter dead, is something to look forward to. And judging by the brief clips we see of Balem in the trailers, it is yet another role that Eddie Redmayne is able to perfectly fill. The Wachowski siblings’ last completely original science fiction film was the conclusion of The Matrix trilogy in 2003. The Matrix is one of the biggest and most successful sci-fi films to date, and with the creators of that behind the creation of Jupiter Ascending, it’s safe to assume that it will be both entertaining and incredibly clever… as well as a little bit mind-boggling! Star of Jupiter Ascending Douglas Booth has labelled the film as “a cross between The Matrix and Star Wars”. Yes, that’s right, The Matrix AND Star Wars?!? Those are two of the biggest and best-loved films around; what could possibly go wrong?! 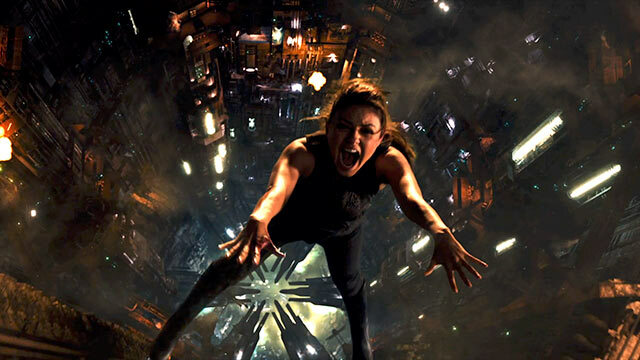 Not only is this the Wachowskis’ first 3D film, there are also said to be thousands of special effects in Jupiter Ascending, with one of the reasons given for postponing the release date being that they need to finish some 3000 of them! With much of the film seemingly set in space, the effects are no doubt going to be absolutely mind-blowing with the 3D only intensifying them and really bringing them to life. One thing is for sure, Jupiter Ascending will most definitely be a visual spectacle! Jupiter Ascending is in cinemas from 6 February 2015.